Welcome to our first guest blog post! 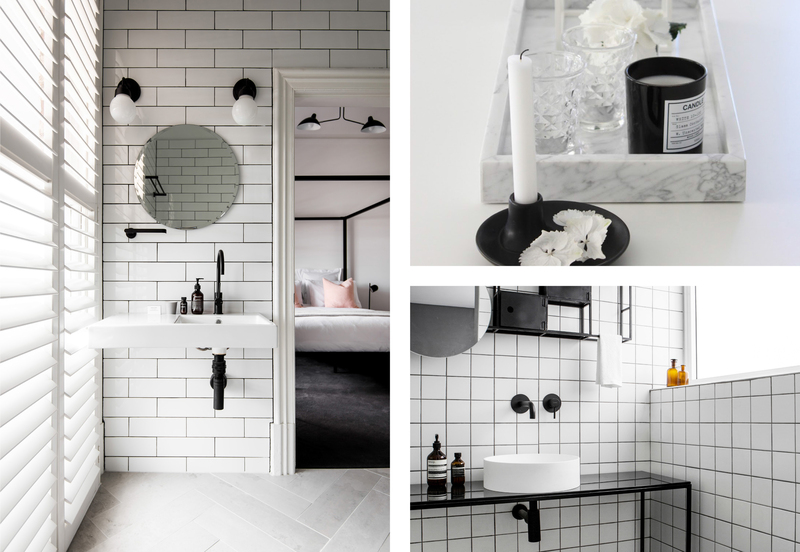 We would like to introduce contemporary interior designer Louise Parker of Studio Gabrielle who is sharing her vision on bathroom trends for 2017! Louise is inspired by Nordic principles of Simplicity, Elegance and Functionality and we can't wait to hear her thoughts for the coming year. 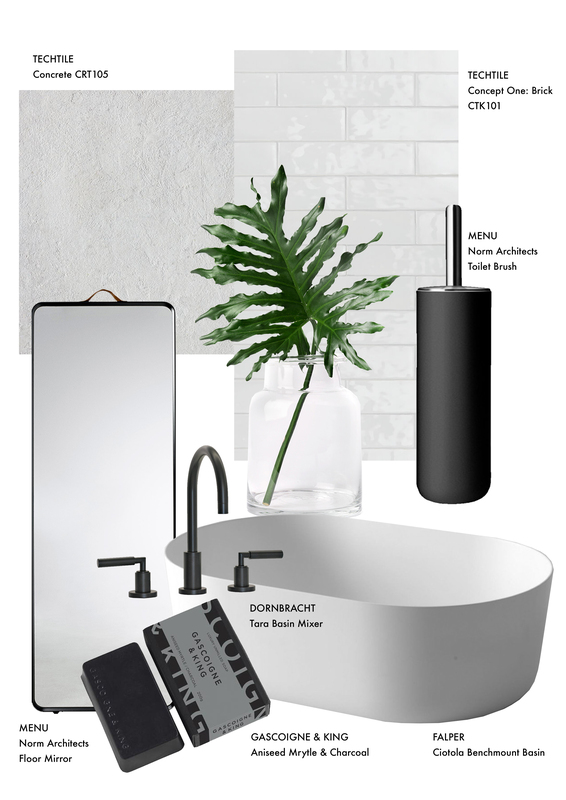 2017 will be an interesting year for bathroom design with designers taking inspiration from all around the world, including Paris’ Maison Objet and Milan’s Salone Del Mobile. Bathrooms are often the only place where people regularly have time to themselves. 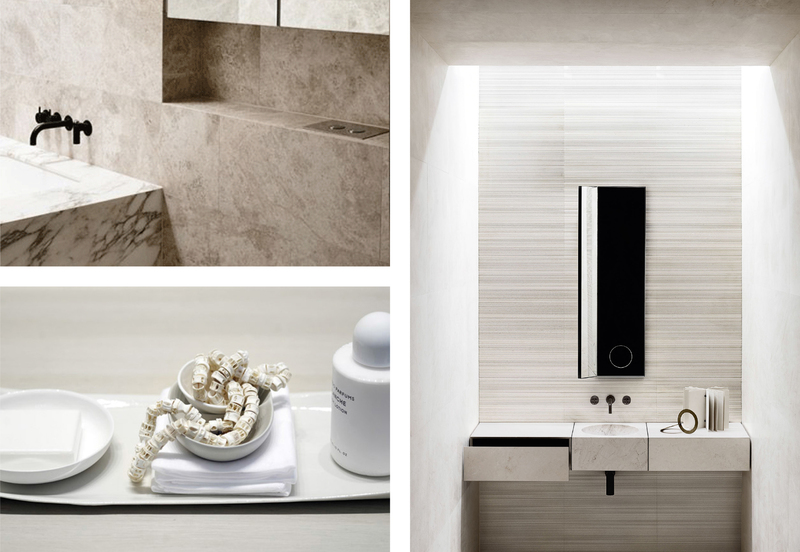 For that reason bathroom design should create a refuge of serenity and personal luxury. Make a statement with a monochromatic palette. Contrast high gloss or muted matt black finishes with white and chrome. 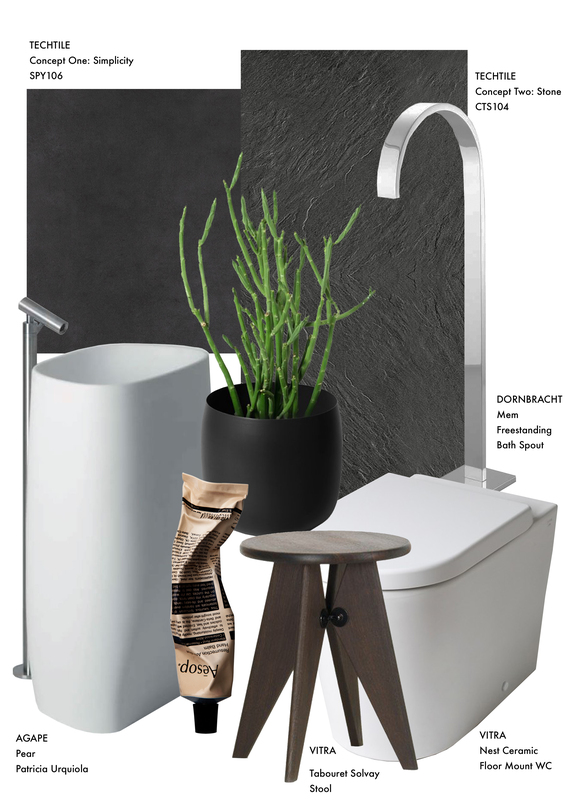 Accessorise to make a statement, or be bold with a daring centerpiece like a freestanding black and white bath. Emphasise the impact by keeping the rest of the palette neutral with either light or white tiles, try white subway tiles from techtile’s Concept One Brick collection and mix with a neutral grey floor tile from the Concrete collection. This will make key elements stand out including statement matt black tapware which is a trend threading through from 2016. You can even go one step further by using black grout between white subway tiles for high impact. Black and white remain timeless. Whether you are freshening up with new towels and soap dispensers, or completely changing the space. This trend is all about bold, dramatic visual theatre which radiates an aura of self-assurance. Making a contemporary statement and leaving an impression. A huge trend for 2017 will be the use of minimal materials in more ways. Go for simple, bold aesthetics with natural stone and elegant organics shapes for a timeless aesthetic. Head for large format stone effect porcelain tiles, which will give the illusion of more space because your eye-line is naturally drawn outwards - try techtile’s Blends in BLD103 800x800mm. The porcelain alternative is maintenance free and will give a sense of luxury without the price tag, creating a wellness oasis that insulates you from the stress of the outside world. 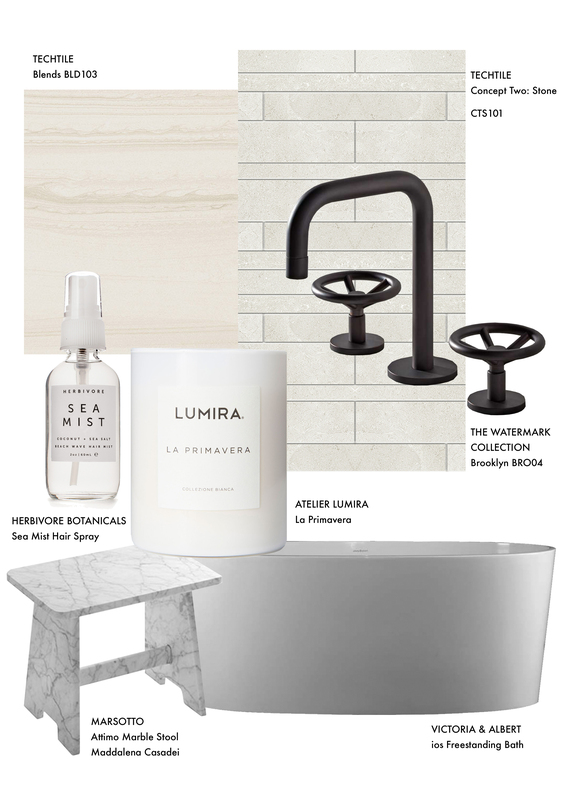 Use the same material for floors and walls with a solid, quality masonry aesthetic, without losing the residential feel which will create clean lines with a soft setting - an almost spa like scene. A more masculine vibe with darker tones influenced by texture and materiality to bring in warmth. Dark bathrooms often feel intimidating, that shouldn’t stop you from recreating this trend in your next project. You need to think about firstly, the amount of natural light diffused in the space, secondly the amount of ‘white’ which includes all the sanitaryware in the space. Dark colours, when done right, have impact, are extremely tasteful and give a sense of warmth in a bathroom. When selecting finishes for a space with this trend in mind, use texture to balance the darker tones with a combination of a solid texture on the floor and soft texture on the walls in dark shades of grey, black and navy blue. Try out techtile’s Concept One Simplicity SPY106 with Concept Two Stone CTS104. Use feature walls behind basins or in a shower recess, a subtle way to introduce interest to the space. 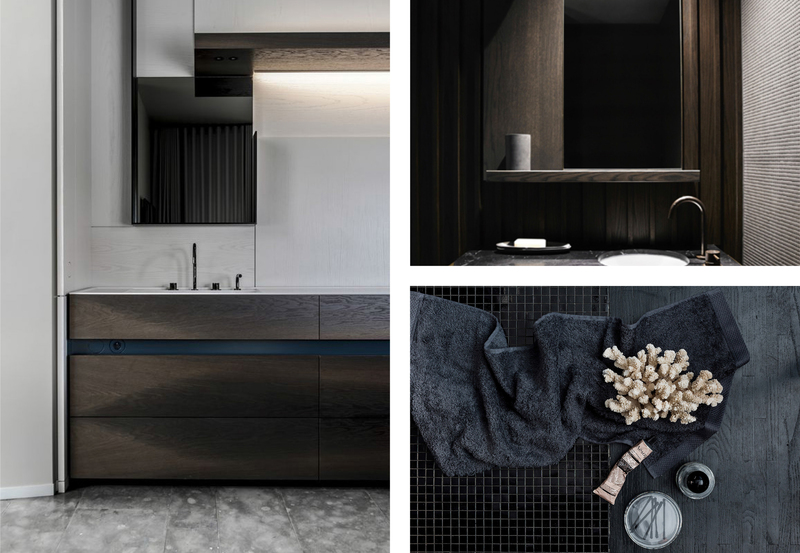 Create contrast by introducing lighter and softer elements to the space through accessories and cabinetry - try out a dark walnut and techtile’s Chic range.